The Central Library of the University was established in 1911 inside the Administrative Block. The present Central Library building was built in 1978 and in 1996 a new block was added. The covered area of Central Library is 4012.11 Sq. Mtrs. Resources in Medicine (ERMED-India) Consortium, New Delhi, India Which we able to access 242 high quality online e-journals from five leading Publishers. The Central Library has a collection of 39353 books, 28180 bound volumes, 2681 Book Bank, 3207 Thesis and 1088 CD’s till March 2018 (as per holding shown on KOHA-Library Management Software) and the Central Library Subscribed 180 print-Journals, 993 e-journals, 4108 e-books, 52157 video’s and 3836137 image’s for the year of 2018. Library has been automated with ‘KOHA’ (Library Management Software). 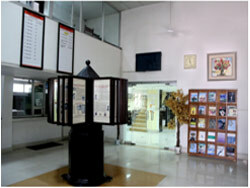 Online searching of documents through OPAC (Online Public Access Catalogue) is available on the computers connected to Central Library LAN via URL searching mode http://172.16.26.35 All the books, journals and thesis are tagged with radio-frequency identification system (RFID) and for its Security to Magnetic Detection Gates have been installed in the Library for ensuring the security of documents. Closed Circuit TV’s installation have been done in all wings of the library. With the efforts of former Vice Chancellor, Prof. Hari Gautam and the then Honorary Librarian Prof Madhu Mati Goel, the renovation of the Central Library was done during the year 2007-10. Today, the reading rooms are attractive and the facade of the library is very pleasant. In 2014, Prof. Ravi Kant, Vice Chancellor, gave a massive thrust to the library by increasing the library budget many folds. With the goal of updating the library and making it at world-class level, the library purchased a large number of valuable and prestigious books and journals (online and print). A new renovated section of keeping the journals was also commissioned.